AKA how to layer in the tropics. We can all agree that the Philippines is hubadera-friendly for most of the year, but now that rainy season is pouring in, we can finally warm up, fashion-wise! Here are easy, non-committal ways to layer (for when it pours in the morning and shines in the afternoon). 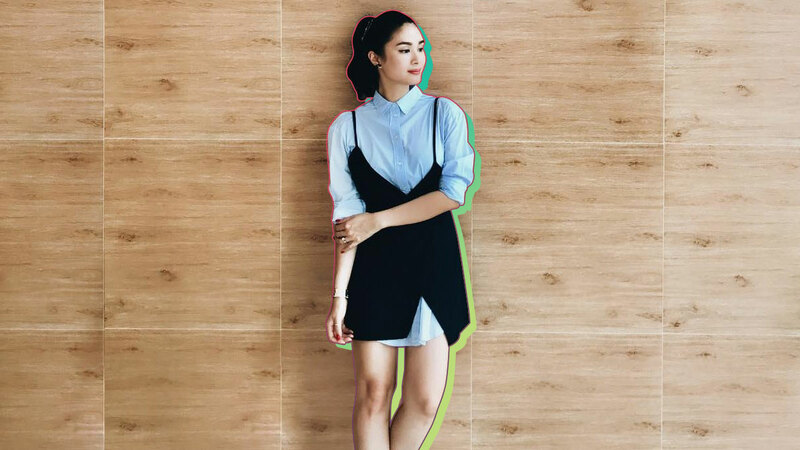 This dress + button down combo is indoor-outdoor friendly. Throw in high socks for extra cuteness. Remember when co-ord tracksuits were all the rage? Time to bust them out again, ladies. With a faux turtleneck! It's not as warm as the full cover. Wear it in a sunny color and keep in theme with the indecisive weather. Office attire or casual wear, it'll work out for you! Just a change of shoes—heels to sneakers—makes all the difference. Throw on your trusty denim jacket over a sporty ensemble to level up your look from gym to a brunch. Weare your sweats like blogger Renee De Guzman does—Ariana-style: oversized, and shoulders bared (in case it gets a little warm, suddenly). Invest in a super-cute jacket that instantly dresses up any outfit. If you get warm easily, opt for an easy breezy knit dress like Sam Richelle. The fabric is warm, but the cut is comfy and free.